(Asheville,NC) – Just beet it! Green Man Brewery has a special limited release brewing in preparation for the creepiest time of the year. Thriller is a Blood Orange Saison, with the addition of beets allowing for a grisly sanguine hue. It will be available in 750 mL bottles on October 16, and on draft at the Green Man tasting room on 27 Buxton Ave in downtown Asheville. This traditional rustic farmhouse ale is brewed with generous additions of Amarillo hops which have a floral and grapefruit aroma, complementing the zesty blood orange. The spicy and dry notes of the Saison yeast linger among flavors of citrus and earth creating a distinctive palate. At 7.7% this beer is sturdy yet very easy to drink. Beware, it is so good you may want to howl at the moon! 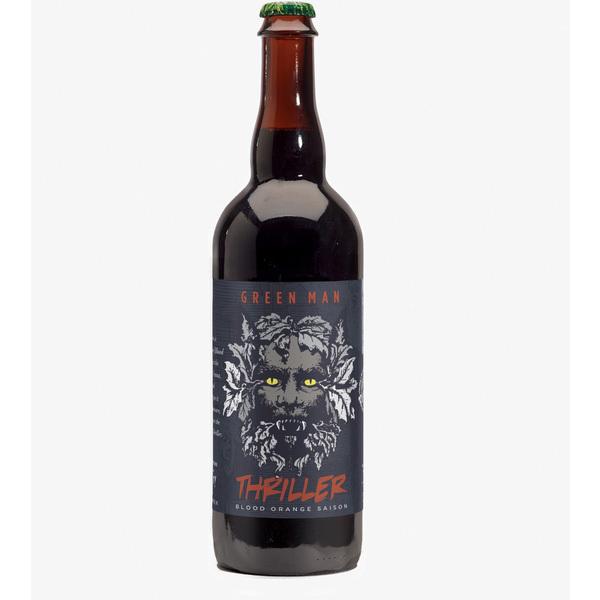 Thriller is the newest member of the high gravity series joining legendary ales such as Dweller Imperial Stout, Demon Dweller Barrel Aged Imperial Stout, Holly King Barrel Aged Holiday Ale, La Mas Negra Imperial Black Ale and Rainmaker Double IPA. Bottles will be available for purchase at the brewery in downtown Asheville and at select bottle shops throughout North Carolina. The legendary Green Man has existed for centuries but it’s no myth that he’s been brewing great beer in Asheville since 1997. Green Man has been producing some of the beer scene’s most iconic ales for 18 years. Green Man’s traditional English flagships are recognized for quality and consistency and the specialty program is renowned for exciting and innovative creations.